I donated a kidney altruistically October 2017. The recipient hasn't contacted me yet, so I don't know anything about them other than that they were at a different hospital. I've been thinking about being a kidney donor for years, at least since I was in college. I grew up really poor and without insurance or access to medical care. My grandma died because she didn't have it. My mother has very bad health because of it. It had a terrible affect on my family, and I have always been very involved in trying to help others have better experiences. Helping others is a huge part of my life, but I always treated my wish to donate as secondary. I'm signed up as an organ donor and figured that my organs could save someone if I died before I donated. Then a friend of a friend needed a kidney and my friend started sharing stories and resources online. I learned about the differences between living and deceased donors. And I learned that statistically my organs may not even be salvageable when I die to help others. I started to do more research and decided I was in a good place to donate (and I might not be forever). I could take PTO from work and I live with a roommate so I wouldn't be alone. The friend of a friend found a kidney, but I decided to go through with the process anyway - there is a donation center right here in my city and I was able to do it. I felt no real reason not to. Honestly, that was it. I had the chance to help someone in a way that not everyone could, so I did. I signed up in December 2016 and started the testing process the next month. I spent 8 months on the donor list hoping to help multiple people. My coordinator and I agreed that I would wait 9 before donating directly, so it worked out perfectly! On the other side of things, I'm not religious at all and politically I'm an anarchist. You'd be surprised how much support there are from within those communities for what I did. I was an altruistic donor who started a chain with the Paired Kidney Exchange. There were 4 pairs involved but I don't know anything about the other people. I was the only one at my donation center to my knowledge. In some ways I think it's easier that way. As far as preparation, I googled everything I could think of, so I didn't settle on one place. I looked at a lot of Instagram stories, but I was disappointed there wasn't more information available about what it's like after you donate. Like, how you feel and what's hard and what the side effects are. My donation center gave me lots of information that was useful, and I was assigned a coordinator that was beyond helpful. She answered all my questions for me! Honestly though, by the time I signed up I was in 100% and as long as I was deemed healthy enough I was going to do it, internet info or not. I have had a few people reach out to me via Instagram since by surgery to ask questions and that was pretty great. As far as the whole process, travel costs weren't an issue for me. The hospital (Ochsner) is in my small city and it took about 10 minutes to get to. I get paid a salary (not by the hour), so it was easy for me to schedule my blood draws or testing early in the morning and get to work late, I just worked a little later in the evening. As for the surgery, scheduling it was the hardest part. I let my job know right away once I started the testing so they'd know what to expect. I spoke to HR as well. 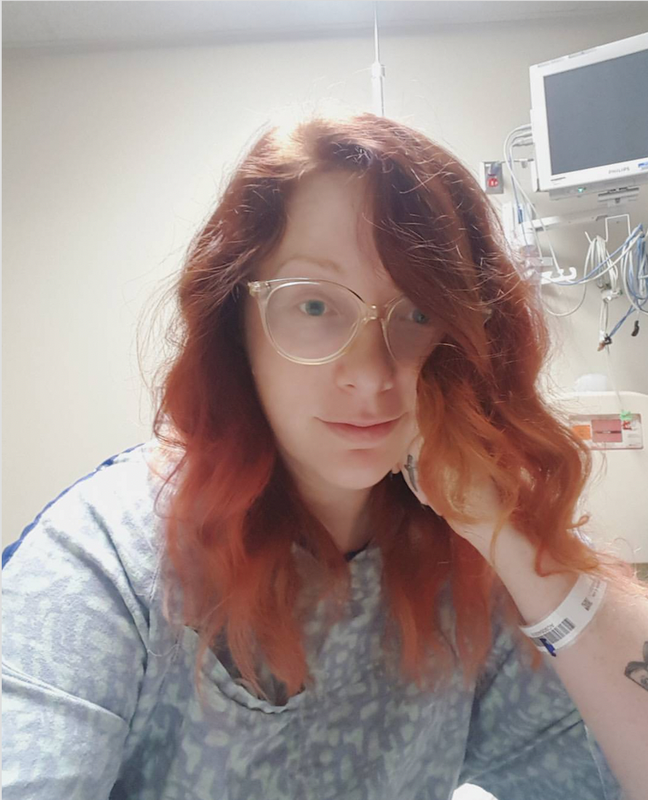 I'm an Emergency Manager, though, and it's been a crazy year for disasters, so I communicated with my coordinator that I would need a month's notice at least for the surgery. When Harvey and Irma hit I was deployed and made sure to communicate too. The only reason I finally got to go home was for the surgery. At work I communicated with my superiors and team. I mean, I was donating a kidney for goodness sake. Everyone was really supportive and proud. I planned to take off for a full month because my job can be very labor intensive and I was concerned I would be deployed to the islands and not have medical access if there were delayed complications. I worked with HR and my kidney coordinator to preemptively file for temporary disability (they just called and certified I went through with the surgery on the planned date and everything else was already done). I filed for FMLA protection at work just in case. And I decided to supplement my disability with PTO. Basically my disability was paying 60% of my wages and I used PTO to make up the difference for the rest (3.2 hours per day, 5 days a week). I had plenty of PTO saved up, but my business also has emergency PTO you can petition for if you run out. Aside from the gas going to appointments which was too negligible to track and my PTO (if I had a different job I would have gone back after 2 weeks), I spent a total of $6 at the hospital on my painkiller prescription and about $30 on recommended over the counter medication. I feel like I would have been gone working after 2 weeks if I worked an office job. Daily life was fine, I had a roommate who helped me for a few days after being released and then I was fine to take care of myself. The process was very smooth. My coordinator checked in with me every so often and mostly I just waited to hear about a match. Once that happened it was very hectic because I was deployed in Texas for Harvey relief, but I got medical clearance to go home to complete the final testing in time for the surgery. To prepare I made sure that my roommate knew everything and would be around for 2 days after I got home. She helped me make sure I took my painkillers on time and encouraged me but mostly I didn't need any help. This was my first surgery and I wasn't sure how my body would react so I was overly cautious. I went shopping for over the counter meds (my coordinator gave me a list) and I meal prepped for a week so I wouldn't need to worry about cooking. I took off of work the day before surgery so I wouldn't be overwhelmed trying to get too much done. I went to sleep early so I'd be well rested. Oh, I also filled out power of attorney forms and medical paperwork in case something went wrong. I updated my will. That really freaked my family out, but I think it's important to consider. As far as peoples' reactions, mostly they were really surprised and wanted to know why. When they found out I wanted to donate to a stranger, people were really weird about it. Never mean, but more like "are you sure, honey?" Then once I reassured them I was working with a whole team of professionals, they all said I was really brave and more people should be like me. I always offered to go with them for testing so they could do it too but nobody has wanted to do that. I will say that there was a really big focus on reminding me that someday I might have a child who needs a kidney, even though I don't want kids and there is someone who needs a kidney now. That was probably the most stressful thing, to be continuously reminded of that. Lots of people were happy for me. I did have a good support system, lots of friends wanted to help and checked up on me. I don't live anywhere near my family, so that was really nice. I don't think I would have felt like I could do the whole process if I was completely by myself. As far as encouragement to other potential living donors, it's so much easier than you think it is. There are lots of people that you can talk to you, and it's so rewarding. I have lots of advice for folks donating! The most important thing though is to be honest with your coordinator, they there to help you and answer your questions. As far as how this experience has changed my life, Wow. Well, I learned a lot about how easy it is to donate and save a life (or lives). Learning about the difficulties people waiting for a kidney face medically, socially, and otherwise has really changed my perspective on things. It's made me very aware of issues with our healthcare system (the cost of my surgery and follow ups is crazy!). I feel connected to a group of people that spans all races, ages, and beliefs who are tied together by their drive to help others by being living donors. It's also pushed me to be healthier myself, if I'm honest. I attended the annual kidney walk fundraiser in New Orleans a few weeks after I donated and it was fantastic. Since donating, I've had several volunteers at work come forward and share that they've received a kidney or a family member has received one or needs an organ. It's not something that gets talked about, but I'm realizing now how common it is. It honestly was a great experience. The only issue I had was with pain management, which I believe was due to the opioid crisis (the normal painkillers they prescribe don't work for me and doctors were hesitant to give me something stronger). That was resolved before I was released from the hospital, though.